Lock in a great price for JW Marriott Cannes – rated 8.4 by recent guests! Karim Cheddad the Chief Concierge was outstanding!!! He really cared that we had a good time. Very patient & friendly. Giovanni one of the breakfast servers was terrific. Best Staff ever. From porters, cleaners, waiters. Nothing to complain about!! I think its not what I expect from JWM, i can book in dubai same hotel with alot of facilities and cheaper! Location, location, and location. 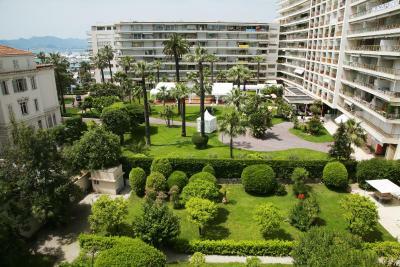 The hotel is centrally located and within walking distance to almost any attraction (most important beaches) in Cannes. The hotel has an old Hollywood theme to it, but don't be fooled, the service is exceptional and the rooms are comfortable and spacious. 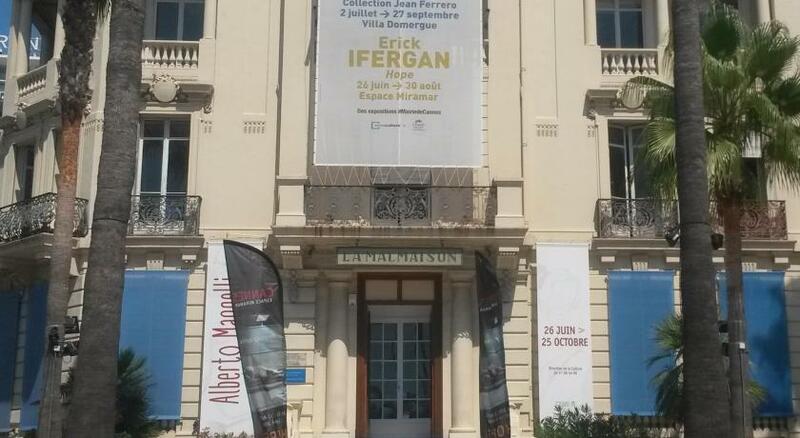 The location is perfect, right on the Croisette. The facility is excellent and the rooms are clean and very well equipped and elegant, probably renewed recently, because it looks like everything was brand new. The housekeeping was perfect. Also the bed and pillows very comfortable. The service was amazing, on the front desk Mr Fadi helped us alot and made things easier. The Majestic,Carlton and Martinez all have more of a French Riviera feel to them than does the Marriott,but what the Marriott lacks in atmosphere it makes up in convenience and modern comfort.The bathrooms work perfectly, and the bed and linens are top notch. The outdoor cafe/restaurant is the best place of all the hotels in Cannes for lunch/brunch with a sea view,imo. Amazing clean rooms and facilities. Location was the best on the beach front. Staff were welcoming and lovely and hotel smelt lovely. Definitely recommend! Food from room service is the same food as you can get at the hotel restaurant, so the food quality was very good. One of our top picks in Cannes.Located on Boulevard de la Croisette in Cannes, the JW Marriott Cannes is just 150 feet from the beach. This 5-star hotel offers a rooftop swimming pool, a casino and a shopping gallery. Accommodations at JW Marriott Cannes blend shades of cream and chocolate with a Film Festival-theme. Each room has an LCD satellite TV and some rooms have a balcony with views of the bay and the Lerins Islands. Other facilities at JW Marriott Cannes include a 24-hour reception with a currency exchange service and a business center with WiFi access. JW Marriott Cannes is 19 mi from Nice-Côte d'Azur Airport and a 15-minute boat ride from Sainte-Marguerite Island. Private underground parking is possible on site. Cannes City-Centre is a great choice for travelers interested in shopping, luxury brand shopping and restaurants. This is our guests' favorite part of Cannes, according to independent reviews. When would you like to stay at JW Marriott Cannes? Offering a city view, these air-conditioned rooms feature luxury bedding with mattress topper, comforter and pillows and a king or twin bed. Featuring decor inspired by movie stars, these elegant rooms have a flat screen TV with satellite channels and a private bathroom with separate bathtub and shower. Amenities of comfort and convenience include a lighted makeup mirror, bathrobes and slippers. Private parking is available on site (reservation is not needed) and costs EUR 40 per day. Offering a view of the grounds, these air-conditioned rooms feature luxury bedding with a mattress topper, comforter and pillows and have a king or twin bed. Featuring decor inspired by movie stars, these elegant rooms have a flat screen TV with satellite channels and a private bathroom with separate bathtub and shower. Amenities for comfort and convenience include a lit makeup mirror, bathrobes and slippers. With movie star themed décor, this spacious suite features a separate living room with a sofa bed and city or garden views. Some bedrooms have a king bed and all suites have a flat-screen TV with satellite channels and a private bathroom with both a bathtub and shower. Extras include a make-up mirror, bathrobes and slippers. Offering a partial view over the Mediterranean Sea, these air-conditioned rooms feature luxury bedding with down mattress toppers, duvets and pillows and are equipped with king-sized or twin beds. Boasting a decor inspired by movie stars, these elegant rooms offer a flat screen TV with satellite channels and a private bathroom with separate bathtub and shower. Amenities include a lighted makeup mirror, bathrobes and slippers. With a movie star themed décor, this prestige suite features floor-to-ceiling windows and a private balcony with views of the Mediterranean Sea. There is also a separate living room with a sofa bed, a bedroom with a king bed, 2 flat-screen TVs with satellite and pay-per-view channels. Extras include a private bathroom with both a bathtub and shower, Chopard toiletries, a make-up mirror, bathrobes and slippers. With movie star themed décor, this suite features floor-to-ceiling windows and a large private terrace with views of the Mediterranean Sea. There is also a separate living room with a sofa bed, dressing room, bedroom with a king bed, 2 flat-screen TVs with satellite and pay-per-view channels. With a movie star themed décor, this prestige suite features floor-to-ceiling windows. There is also a separate living room with a sofa bed, a bedroom with a king bed, 2 flat-screen TVs with satellite and pay-per-view channels. With a movie star themed décor, this suite features floor-to-ceiling windows and a large private terrace with views of the Mediterranean Sea and Cannes Bay. There is also a separate living room with a sofa bed, dressing room, dining area, bedroom with a king-sized bed, 2 flat-screen TVs with satellite and pay-per-view channels. New Year’s Eve Menu at the hotel restaurant with live music, welcome and midnight champagne, wine and mineral water included for up to 2 people. Live a real cinema star’s experience. Now it’s JW Marriott Cannes time. With its 211 rooms and 50 suites, the hotel awaits you for a memorable stay. Each of our rooms strike the perfect balance of form and function with sophisticated stitched leather, and shades of chocolate and cream – all under the gaze of legendary film stars. Our restaurant JW Grill Cannes as introduced a new concept on the Croisette with stunning views of the Mediterranean. A fine dining restaurant with authentic cuisine including tender hand-cut selections of American USDA prime beef, grilled to perfection; crisp salads, fresh seafood and mouth-watering desserts perfectly matched with fine wines. The JW Grill Cannes restaurant is the ideal place to relax facing the sea. Furthermore, discover the most beautiful view of the bay of Cannes with our panoramic rooftop terrace including a swimming pool. Hotel surroundings – This neighborhood is a great choice for travelers interested in shopping, luxury brand shopping and restaurants – Check location Excellent location – show map Guests loved walking around the neighborhood! House Rules JW Marriott Cannes takes special requests – add in the next step! One older child or adult is charged EUR 60 per person per night in an extra bed. JW Marriott Cannes accepts these cards and reserves the right to temporarily hold an amount prior to arrival. Please note that the outdoor pool, as well as the rooftop, will be closed from 19 April until 03 June 2019 inclusive. Was slightly noisy at times. Hotel gym is very small. very bad service of the frontdesk guy and housekeeping guy first night, it strongly hurt the hotel though the following two days are ok. And it let me know that JW Marriot brand is not good for the hotels under this brand have no standard, in general, I don't have good impression in JW Marriots which I have been stay. This time it makes me give up this brand, I will not book the JW Marriot in the future, please remind me if I forget it. Better with Parquet on the floor, i.e. cleaner. Nice room and good service. when we came cannes we always prefer marriot. Everything was great - thanks! Breakfast was much too expensive and they should have halved the cost for a continental version. The beds were enormous and very comfortable.Towels were changed at least twice a day and the room was immaculate. Had to request toilet paper Had to request shower gel Receptionist had an attitude problem Breakfast poor in choice , poor service Bed not comfortable Not what I expect from a Marriott Hotel. Ive previously stayed in most in the UK , few in Europe and USA thought this was one quite poor on staff service and room facilities We booked a suite ... 2 chairs next to bed abd window Really??? Expensive ‘ suite’ for a room with 2 chairs next to window ?!?! Won’t go again !